The primary reason for the Australian Gold Lunar Dragon 1 oz Series 2 popularity is their exquisite quality. Many collectors assert that The Perth Mint is without equal when it comes to producing collector coins. Beautifully struck – the Australian Gold Lunar Dragon 1 oz Series 2 features raised, reflective surfaces which contrast with satin-like fields. This feature can best be seen on the obverse, with the image of Her Majesty Queen Elizabeth II, which graces the front of all the Lunar Series coins. 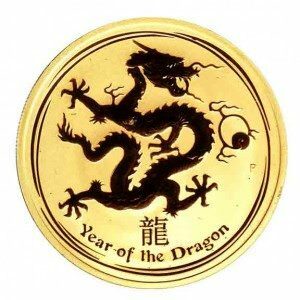 The reverses of the Australian Gold Lunar Dragon 1 oz Series 2 coins carry images of the tiger associated with the Lunar Calendar year. Another reason for the Australian Gold Lunar Dragon 1 oz Series 2 coins’ popularity is that they are limited production coins. The 1-ounce Lunar Series gold coins are limited to 30,000 coins for each year and clearly have become collector favorites. Another feature that makes the Australian Gold Lunar Dragon 1 oz Series 2 so popular is that The Perth Mint can produce back-dated coins until the production cap is met. This means that the earlier coins are still available and can be purchased near bullion coin prices, permitting collectors who learn of the series late to acquire the earlier coins at bullion coin prices. The policy of minting coins from earlier years is unique to The Perth Mint and for only the Lunar Series coins.